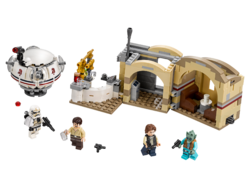 75205 Mos Esley Cantina is a Star Wars set released in 2018. It is the third version of the cantina. This version of the set features an Ubrikkian 9000 landspeeder, which in Star Wars Legends was supposed to be Greedo's landpeeder. Stop by at Tatooine’s Mos Eisley Cantina! Recreate iconic Star Wars: A New Hope scenes at Tatooine’s most perilous tavern, Mos Eisley Cantina. This detailed model has a modular, open-out design for easy play. Slide the door and enter the bar to reveal the detailed interior, which includes a counter for serving refreshments and 2 seat-tipping functions for reenacting the unforgettable encounter between Han Solo and bounty hunter, Greedo. You also get a Ubrikkian 9000 pod with an opening minifigure cockpit and stud shooter on top. 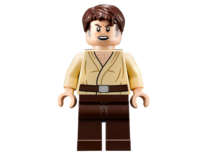 This LEGO Star Wars toy includes 4 minifigures. 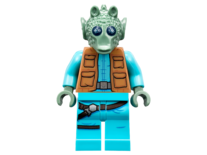 Includes 4 minifigures: Han Solo, Greedo, Wuher and a Sandtrooper. Mos Eisley Cantina features a detailed bar, sliding entrance door, seat-tipping functions, open-out design and detachable sections. 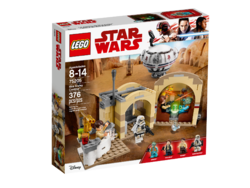 Also includes a new-for-January-2018 Ubrikkian 9000 pod with opening minifigure cockpit and top-mounted stud shooter. 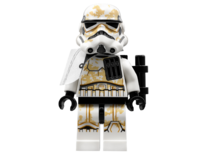 Weapons include 2 blaster pistols and a blaster. Open out the cantina and play out classic Star Wars: A New Hope tavern scenes. Cantina measures over 3” (10cm) high, 8” (22cm) wide and 3” (9cm) deep. Ubrikkian 9000 measures over 3” (9cm) high, 2” (7cm) long and 2” (7cm) wide. 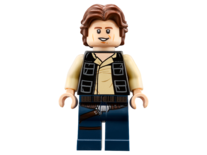 Facts about "75205 Mos Eisley Cantina"
This page was last edited on 9 February 2019, at 22:12.